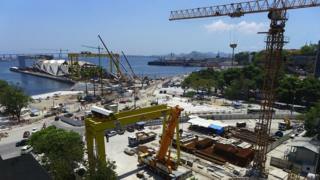 Rio's construction frenzy ahead of the 2016 Olympics is bringing change and chaos to many areas, but nowhere is the makeover more intense than in Rio's long-abandoned harbour region. After decades at a standstill, the region is now the focus of the city's ambitious "Marvellous Port" redevelopment project, inspired by successful port revitalisations such as those of Buenos Aires and Barcelona. Approximately $2.5bn (£1.6bn) is being invested to rebuild infrastructure, upgrade transportation and establish two museums as cultural anchors. The aim is to make the port attractive to businesses, residents and visitors alike in time for the 2016 Olympic Games. But as the first big real estate projects take shape, the focus on building corporate towers and the lack of residential projects and social housing raises concern. Critics fear that the move to attract an upper-class clientele may come at the expense of the area's poorer population. They are also concerned that the port may suffer from the same problem as Rio's central business district, busy on weekdays but deserted at other times. The president of the Brazilian Institute of Architecture in Rio, Pedro da Luz, says the government is allowing the market to set the rules and that real estate companies have shown a preference for profitable corporate structures. "The government isn't steering things in the right direction," he says. "They should be stimulating residential projects both for richer and poorer people, to make this a mixed area, and not another neighbourhood for privileged Brazilians." Mr da Luz says the initiative is a chance to foster social diversity, moving away from class divisions so often seen in Brazilian cities. However, he thinks that the opportunity is being wasted. City officials insist they are working towards the goal set for the project: a 50-50 mix between commercial and residential buildings, including 2,200 social housing apartments. Alberto Gomes Silva, who runs the company which manages the redevelopment, says the government is aware of the commercial pressures. He says it has responded with a package of incentives to ease building restrictions and make housing projects more attractive in the region. He expects to see the first results this year. "But the effects in real estate will come after 2016, after the dust has settled. For now the focus is rebuilding urban infrastructure." The harbour region incorporates three different neighbourhoods just next to Rio's city centre, potentially a prime area for real estate. Years of neglect have led to a low urban density. Currently only 32,000 people, most of them on low incomes, live in the area. Authorities aim to triple the population over the next 10 years, but some established residents are falling victim to the changes. It was in this region that Rio saw its first shanty-town form, up on the Providencia hilltop, over 100 years ago. The Providencia Favela is part of the redevelopment project, but the urban improvements foreseen initially involved demolishing over 800 houses, triggering an outcry in the community. Residents fought back and through public defenders managed to reduce this number to 200. Some of them were demolished to make way for the largest project in the favela, the brand new cable car inaugurated last year. But the $30m project was also controversial, with some residents arguing the community needed more investment in basic infrastructure. In the neighbourhoods surrounding the favela, several old properties used to be occupied by squatters and they were some of the first to go. Architect Lucas Faulhaber says that in the harbour more than 500 families were moved because of the Marvellous Port project. "These families were either moved to housing units miles away or received welfare rent for a few months and were then homeless," he explains. "Rio has a huge housing deficit, but the port redevelopment is not helping to fix that," he says. The Mariana Criola occupation is a rare exception. With support from a movement for homeless people, former squatters won the right to stay in an old colonial warehouse they had occupied for years. The group qualified for funds from the federal government's housing programme. The colonial warehouse will be renovated and a new building for 50 families, designed by Mr Faulhaber, will be constructed behind it. Wilson de Azevedo Filho, 62, is one of those to benefit. "We had to fight hard, but it was worth it," he says. "We're going to have the benefit of living in the heart of the city." As his neighbours, Mr Azevedo Filho's will have five lavish towers by US property tycoon Donald Trump's company, and the Port Corporate Tower, developed by the same US company behind New York's iconic Chrysler Building. Mr Azevedo Filho, who works in a bakery downtown, says living in the port area allows him cycle to work while his colleagues spend hours on public transport commuting from the suburbs. "I work hard, but with my salary I'd never be able to buy a house. There is so much space in the port. I hope others like me will have the same opportunity."